My oldest kid has become a true fan of chicken wings. I’m OK with that, only because he has been a picky eater for the majority of his childhood, so when he wants something that has a bone in it of all things, I’m cool. Normally during a busy week we might order chicken wings because after a long day at work, I really don’t want to come home and heat up a bunch of oil, trim chicken, and fry it. I just don’t. When we do order out though, this kid will take on the chicken wings, not six, but probably ten to twelve of them. To me, that’s impressive for a kid his age, and it’s always a sign that he is growing, not only in size but age. He’s a great kid, and I love him. So with that said, when I do have a bit of time to slow down, I like to focus on low and slow food on the smoker. There were a couple of reasons why I wanted to make these chicken wings for the kid; one is that my neighbor hooked me up with a ton of cherry wood, which I totally appreciated, and I needed to make a batch of my spice rub. I’ve smoked chicken breasts in the past, but never have I smoked chicken wings, so I was up for a challenge of not over smoking the chicken wings, while at the same time trying to impart a great cherry wood smoked flavor, while keeping the chicken moist. I think I won on that front. Start by seasoning your wingettes with the spice rub. Massage it all over the chicken, then place in a plastic, sealable bag, and let it marinate overnight in the refrigerator. The following day, get your smoker ready. Cover the cherry wood chunks with water, and let them soak for a good hour or so. Prepare your smoker however you do that. I use a charcoal chimney to light the charcoal, then pour that into the base of a drum based smoker, using a water pan in the middle, then grill grates on top, only to cover and trap on the smoke. Once the coals are heated up, in my case, dump them into the bottom. Top with a handful of the soaked cherry wood, I added a couple of dry chunks as well, then assemble the rest of the smoker and lay the marinated chicken wings onto the grill grate. Cover and walk away. Or, stay there and begin to smell how amazing that smoke smells, then walk away. Smoke the chicken wings for about one hour, then carefully flip them over, and let them smoke for another hour, then remove from the smoker and onto a baking sheet. 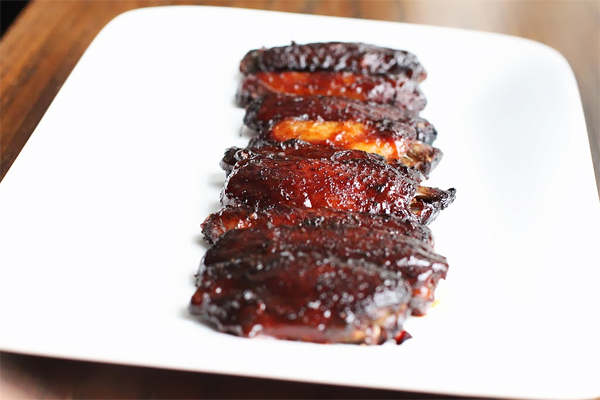 Once you remove them, let them rest, then brush on your favorite barbecue sauce. Place in a preheated 275 degree oven to finish cooking for about 20 minutes. The sauce will get nice and caramelized, almost sticky, and very delicious. Remove, plate, and serve. 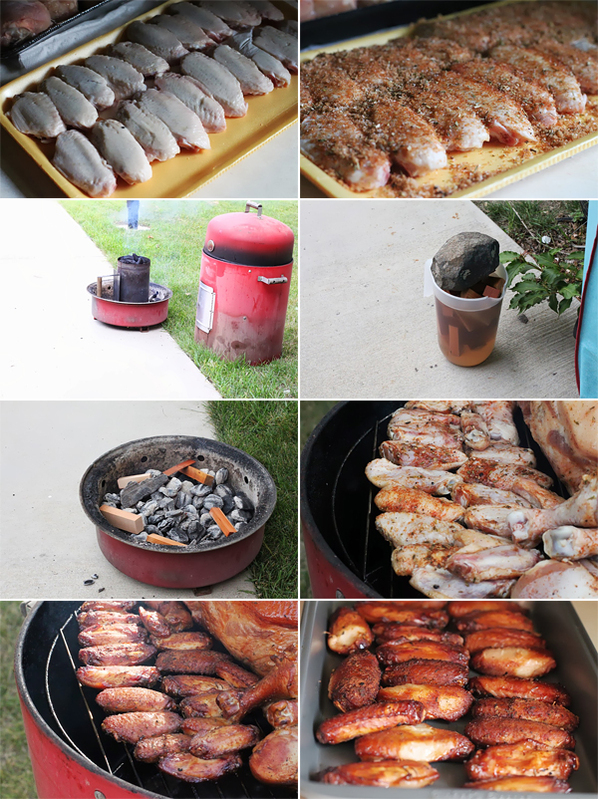 The result are truly great smoked BBQ chicken wings. They were nicely glazed, and the meat had that great pink color from the smoking process that you only get from the smoke ring. This pink was through and through but not overwhelmed by the amount of smoke. Let’s just say my kids love them and so did I. If you have time and want to go low and slow on the smoker, give these a shot. Remove, plate, and serve. 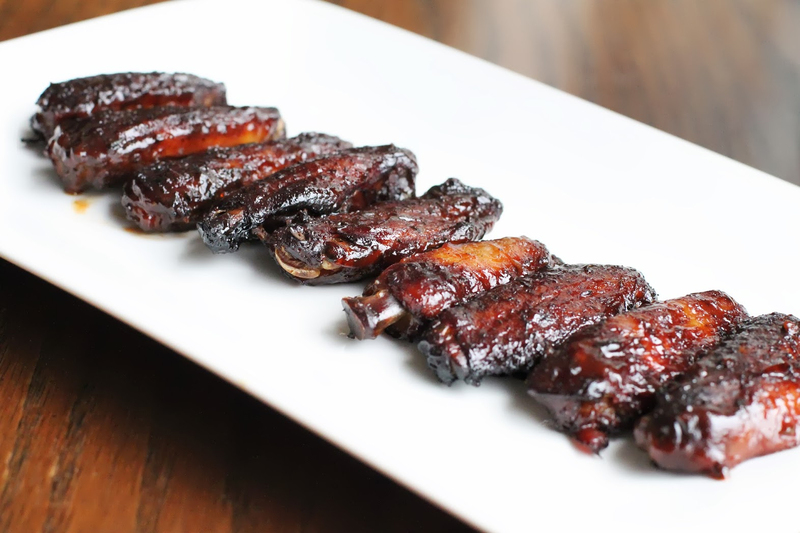 The result are truly great smoked BBQ chicken wings. They were nicely glazed, and the meat had that great pink color from the smoking process that you only get from the smoke ring. This pink was through and through but not overwhelmed by the amount of smoke. Let's just say my kids love them and so did I. If you have time and want to go low and slow on the smoker, give these a shot. I do mine in a similar fashion but after a couple hours, I char them on the grill to give a little extra flavor. I also brine mine for a few hours prior to cooking. Love smoked wings!